Größe dieser Vorschau: 600 × 600 Pixel. Weitere Auflösungen: 240 × 240 Pixel | 480 × 480 Pixel | 913 × 913 Pixel. English: This image shows a view of the trailing hemisphere of Jupiter's ice-covered satellite, Europa, in approximate natural color. Long, dark lines are fractures in the crust, some of which are more than 3,000 kilometers (1,850 miles) long. The bright feature containing a central dark spot in the lower third of the image is a young impact crater some 50 kilometers (31 miles) in diameter. This crater has been provisionally named "Pwyll" for the Celtic god of the underworld. 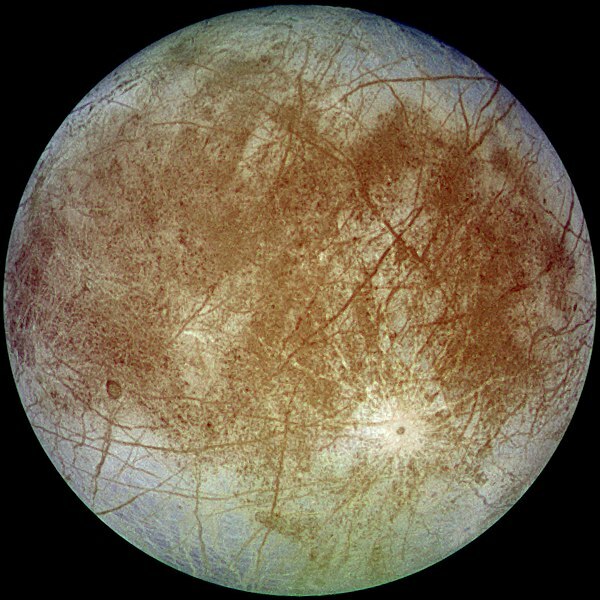 Europa is about 3,160 kilometers (1,950 miles) in diameter, or about the size of Earth's moon. This image was taken on September 7, 1996, at a range of 677,000 kilometers (417,900 miles) by the solid state imaging television camera onboard the Galileo spacecraft during its second orbit around Jupiter. The image was processed by Deutsche Forschungsanstalt fuer Luftund Raumfahrt e.V., Berlin, Germany. Diese Mediendatei wurde vom Jet Propulsion Lab der US-amerikanischen National Aeronautics and Space Administration (NASA) unter der Datei-ID PIA00502 kategorisiert.